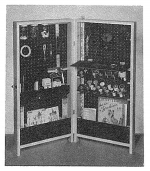 The plan says: This cabinet is a delight in and out of the sewing room. Finished dimensions are when folded. Can be carried easily from one room to another. It has a surprising capacity for sewing accessories, as you will see by the illustration showing it open for use. The cabinet consists of a pair of easy-to-make pine frames, covered on one side with perforated hardboard, then hinged and fitted with handles for carrying. The holes in the hardboard provide a simple way to fasten hangers, pockets and racks for sundry sewing items. There are screw cap jars for buttons and miscellany, and a hinged shelf.